Twin engine-panels at both helms, including engine temp guages, oil pressure and voltmeters etc. With a tonnage around 8.5T she has a fully encapsulated hull & keel giving a semi-displacement configuration. There are sliding doors into the saloon where there is seating to both port and starboard. These two seats can be brought together to convert into a huge double berth. There is a large lazarette storage locker beneath. Stepping down into the galley and dinette area, the galley is to port and has ample storage and work surfaces. Opposite is the dinette saloon with enough seating for five people. This also converts to a double berth. The heads compartment is to port and has a manual sea toilet, shower and hand basin. The forward cabin has a standard in-fill for a double berth or one can remove it to convert into two single berths. Garmin GPS Map 210 Plotter. Cobra Marine MR-F80 DSC VHF. JVC Cassette / FM Stereo. Fairline's are sturdy boats, well thought-of by the marine industry and this model is a popular flybridge/twin-helm, luxury motor-cruiser. She is the Mk II version with the larger flybridge and a generous cockpit which has easy walk-through access via the large sliding door between the wheelhouse and the cockpit areas. Internally she offers spacious accommodation with a large saloon area and further seating in the wheelhouse. This is an ideal boat for liveaboard, canal cruising or coastal hopping trips. The twin Volvo diesels with the boats large fuel capacity deliver safe long range cruising. 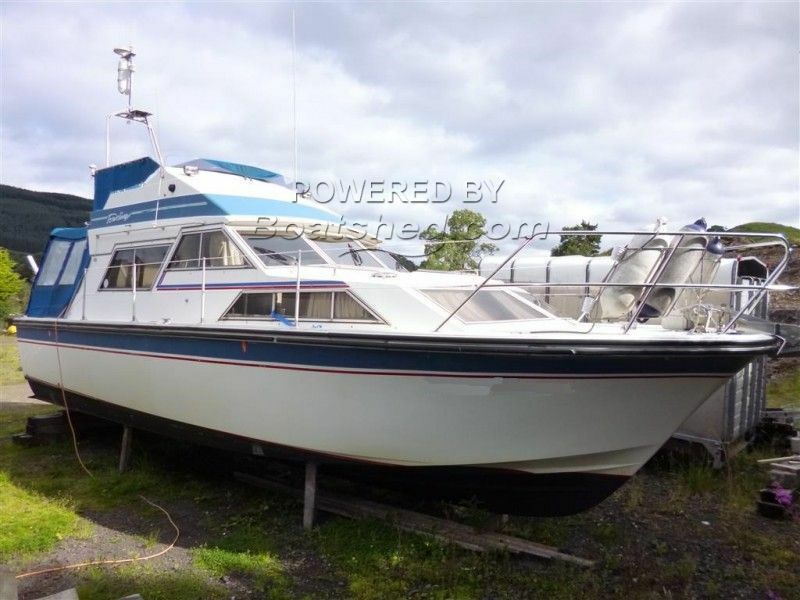 This Fairline 32 Sedan Mk II has been personally photographed and viewed by Derek Armstrong of Boatshed Scotland. Click here for contact details.